A few weeks ago, I went through my cigar bands from 2012. There were three companies that I smoked more cigars from than any others by a widespread. The top three were Ortega Cigars, Drew Estate, and E.P. Carrillo. The majority of visits to the local lounge included a purchase of at least a stick from one of those companies. I just couldn’t get enough of them. After falling in love with the E.P. 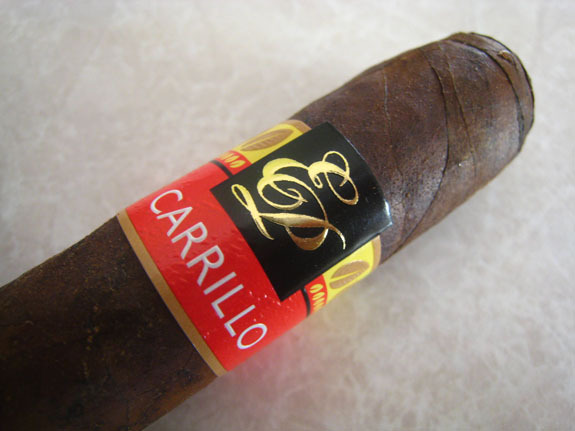 Carrillo Cardinal Natural in the latter part of 2012, I was stoked to hear that the Cardinal Maduro hit the shelves of the local lounge, La Casa Del Puro, just recently. 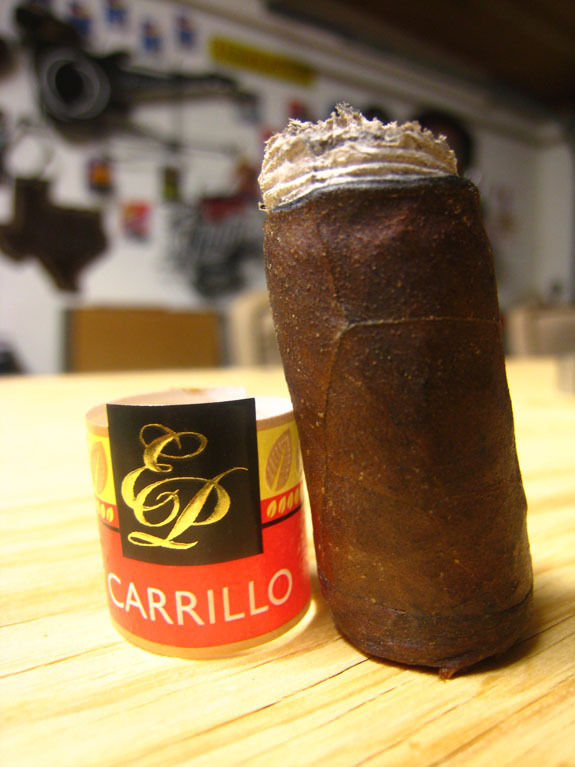 Cardinal comes in two varieties: natural, which is made with an Ecuador Sumatra wrapper, and maduro, with a darker Connecticut Broadleaf wrapper. 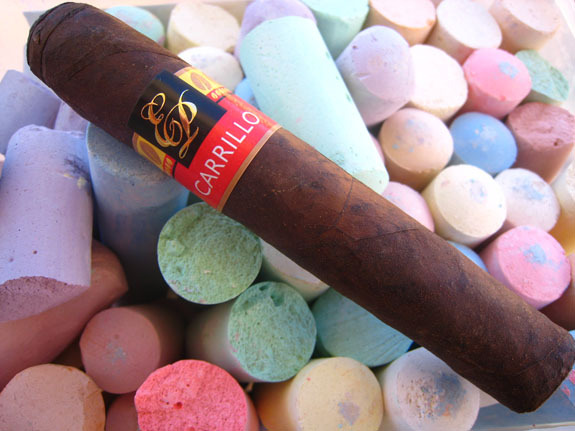 Both use bold, Nicaraguan filler tobaccos and come in three sizes: Cardinal 52, 5 inches by 52 ring; Cardinal 54, 6 by 54; and Cardinal 56, 5 1/2 by 56. They retail from $7.25 to $8.75 and are packaged in striking scarlet boxes of 20. 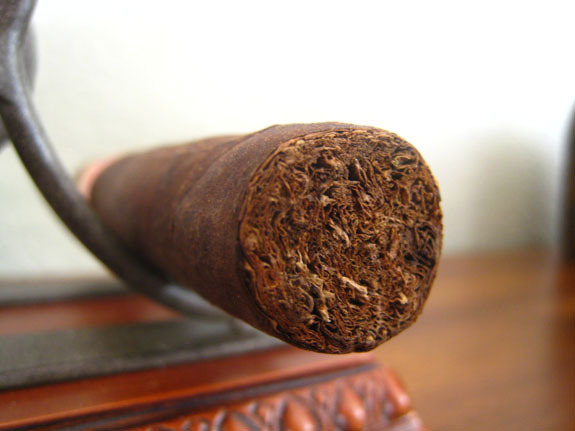 As with most Connecticut Broadleaf wrappers, the Cardinal is very rustic. While the main color is a dark, marbleized brown with a deep red tone, there are significant color inconsistencies down the wrapper. Medium size veins run across the oily, fine tooth leaf. About a half inch down from the head of the cigar, there is a small tear in the wrapper, hopefully this does not lead to any draw issues. 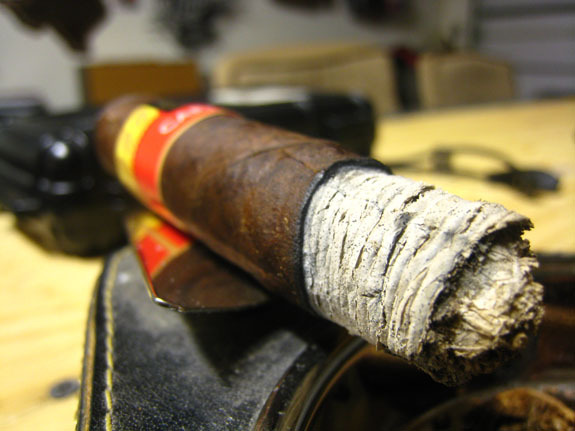 The Maduro wrapper is rich, pungent, and earthy. The fully packed foot of the Cardinal has one of the most welcoming aromas I have ever picked up on. Pepperidge Farm’s Pirouette Rolled Wafers with chocolate filling comes to mind. Wow! The triple cap fits the rustic appearance but gets the job done. My initial cut revealed an extremely firm draw requiring a few extra clips. The cold draw brings out the flavors I picked up on off the foot. After torching the foot, I am greeted with very rich smoke. The flavors remind me of a Costa Rican or Brazilian coffee that carries some cocoa notes. There are some woodsy notes of cedar and an underlying syrupy sweetness. The retrohale brings out some spice, cedar and pepper. The draw is on the tight side requiring a few practice puffs before the smoke fills my mouth. I am a little nervous to clip anymore of the cigar with fear of it unraveling. 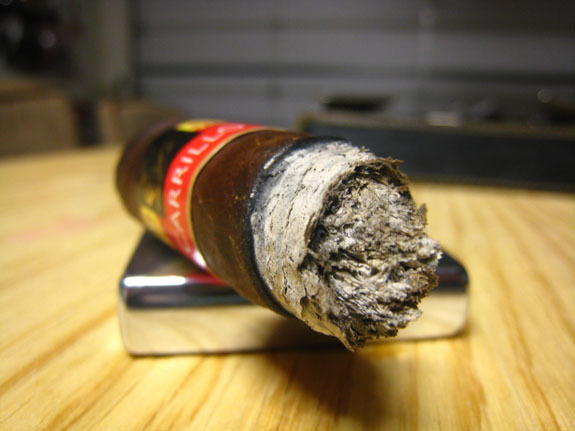 The burn line is exceptional leaving behind a white/light-grey ash that held just short of an inch. The flavors are medium, but I truly believe it is due to the stiff draw that they are not in the full range, which is more in-line with my past experience with this stick. Having enough of the tight draw, I busted out my cigar poker. I now have a bearable draw to work with. The flavors are outstanding. It is like drinking the perfect cup of dark, rich coffee. The cedar/pencil shaving flavor has increased and an enjoyable cocoa finish lingers on the palate. Making my way down the middle third of the Cardinal Maduro, the cedar continues to hold strong with an added touch of vanilla. The spice on the retrohale has kicked up a notch. The flavors are coming across medium/full, and the nicotine is running in the upper end of medium. The burn is still excellent and the ash does not want to drop. Knocking off the ash at borderline two inches, I am into the final third after forty-five minutes of smoking this Cardinal 52 Maduro. I think I finally made it past the plug in the cigar. The spice has become more noticeable in the mouth but it is beyond the Nicaraguan pepper spice I am familiar with. More like a mixture of different cooking spices. The chocolate filled wafer flavors continue to show through. The strength has crept up onto the full side. The burn is still rock solid, and not a single touch-up has been required. I still cannot make up my mind on the wrapper I prefer on the Cardinal series. I guess I’ll have to smoke some more. Man, do I hate that. The Maduro wrapper highlights sweetness that I really enjoy which was not found in the Natural version. 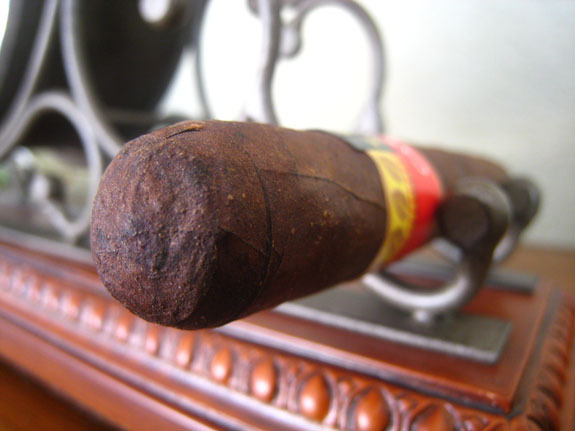 This is the first Cardinal Maduro I smoked where the draw put up such a fight, which is a reminder that these cigars are handmade and some construction issues can be expected. As long as the draw issues are not consistent in the line, which I do not think they are, this will be a cigar I will be revisiting often. Make your way down to your local B&M, give this E.P. 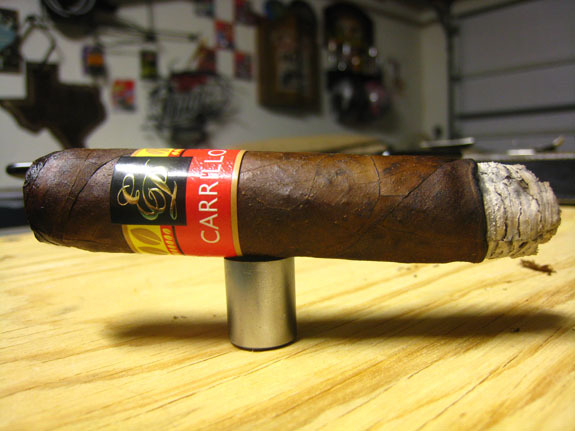 Carrillo Cardinal Maduro a whirl and let us know what you think. Again, a big thanks to everyone who participated in the Screwpop Cigar Punch Giveaway. We received a huge response. A random number generator was used to select the winning entry. Today’s lucky number is “7”, which is Revjava’s comment!! Congrats, Ryan. If you will please e-mail me your address at [email protected], we will have the cigar punch and sticks out to you this week. I Love me some EPC nuff said… Oh love the picture with the Chalk. Corey, couldn’t agree more on the EPC cigars. I am a complete sucker for them. Haha. The chalk was left in the backyard by my daughter. The picture ended up coming out pretty cool. You should smoke one of those chalk sticks. Pair it with some Milk of Magnesia. Mmmm! I need to pick up one of those – the EPC, I mean.